In a bid to tackle youth crime and truancy, Mayor Boris Johnson has called for first-time offenders to be held separately from "career" criminals. The mayor released his Time for Action plan in Edmonton, north London, and invited public comment. Mr Johnson said his proposal would prevent young people from becoming repeat offenders. He also announced plans to establish specialist mayoral academies to help equip young people with life skills. Londoners are being invited to submit their views on the plan by 16 December. "Young offenders and first-time prisoners are coming out of these institutions having been educated in nothing but crime," Mr Johnson said. "I think we should be trying to keep them separate from career criminals so they can get the education that they need." He added: "There are no magic answers to these deep-rooted problems and there will no doubt be amendments and additions to the measures I am proposing." Other measures include better education for children in care, and using organisations such as the Scouts, Girl Guides and the police cadets to help develop "self-respect and character". 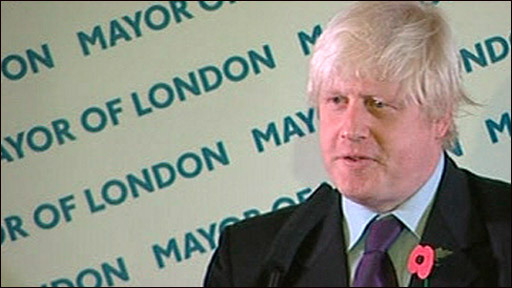 The plan forms a key part of the mayor's response to teenage killings and violence in London. "It is a tragedy that 27 teenagers have become victims of knife and gun crime this year," said Kit Malthouse, Deputy Mayor for Policing. "If the proposals in the action plan are implemented by relevant agencies we could literally turn around the lives of thousands of disaffected, vulnerable young people." Opposition members of the London Assembly cautiously welcomed the mayor's proposals but said they did not go far enough. "It's not a bad idea as far as it goes, keeping young people away from hardened criminals," said the Green Party's Jenny Jones. "But for first-time offenders, a period of really tough community service would be a much better way of teaching young people how to be part of society."